ackson Springs man was airlifted to a Trauma Center following a single vehicle motorcycle accident outside of West End early Saturday. 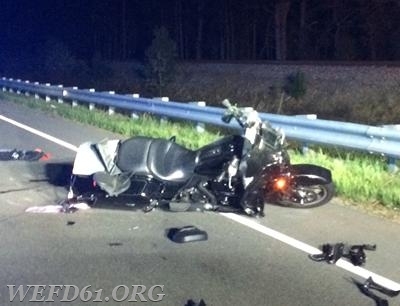 Emergency responders were dispatched at 3:22 am for reports of a motorcycle accident on NC Highway 211 near the intersection of Hoffman Road after a motorcycle that was reportedly traveling westbound crossed the center median and crashed coming to a stop in the middle of the two eastbound lanes of the roadway. After arriving on the scene fire officials requested a helicopter be dispatched to assist with the accident. An ambulance transported the victim from the accident scene to a landing zone that was established behind the West End Fire Department so that he could be flown to a Trauma Center. NC Highway 211 was partially blocked by the accident while the injured man was assisted and the accident debris could be removed from the roadway. Responding to this wreck were units with West End Fire & Rescue, Moore County EMS, Moore County Sheriff’s Department, and the NC State Highway Patrol. The accident remained under investigation by the NC State Highway Patrol as of this report.